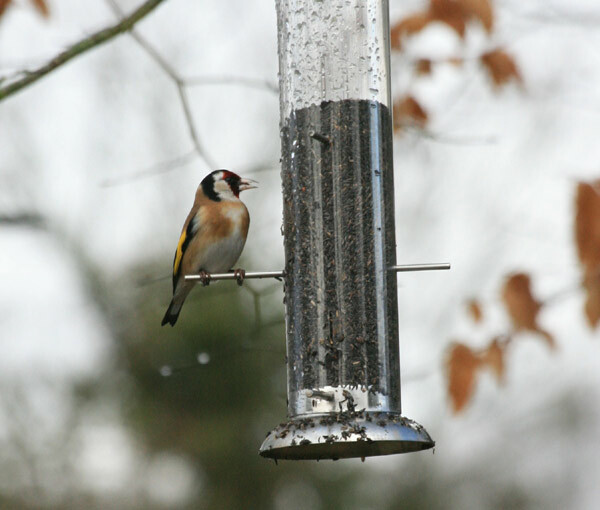 The goldfinch is one of our most beautiful native birds and we’re so excited to have them in our garden. I photographed this one earlier today feeding from our finch feeding station. We were at friends for coffee recently and outside the kitchen window they had several feeders which were covered in Goldfinches … it’s all due to the type of seed apparently and the type of feeder. This particular feeder has small slits in the side which can only be accessed by birds with long fine beaks so the Goldfinch is perfectly equipped for the job. Another great tip they gave us is to use black Niger seed … they go mad for the stuff. Within 3 days of putting the seed out we had several birds feeding … and now we have between 5-10 feeding at any one time. Niger seed is available from most good pet shops or alternatively try the garden center.